Big branching campaigns with lots of interconnected scenarios and unit carry over have always been a signature feature of this genre, and they will remain the key feature of Panzer Corps 2. The initial release will feature a brand new Wehrmacht campaign that will be a middle ground between Panzer Corps vanilla and the Grand Campaigns in terms of size, and will feature both the European and African theatres in a single interconnected tree of scenarios. Our design goal is to make various historical and fictional branches well balanced in terms of length and interest, in order to improve campaign replayability. We hope that the new campaign will offer a sufficiently fresh and different gameplay experience. Besides this classic mode, we also want to give our players new experiences to try, and they will be based on our new random map generator. The generator is able to generate maps of different size and type (continent, island, archipelago etc.) with up to 8 players struggling for control, various mission objectives, starting conditions and play options. So, the number of combinations to try is virtually endless. With such a random generator in place, the next logical step will be to generate full-blown random campaigns, based on date range, number of scenarios and opposing factions selected by the player. Another possibility is to integrate a few random scenarios into a classic, human-designed campaign. The list of factions in Panzer Corps 2 is, of course, very similar to its predecessor and includes most of the nations which fought in WW2. But the list of units will be more extensive. The initial list of units is based directly on Panzer Corps with all its patches, DLCs and expansions. So we start where the prequel finished, and we are adding a few things on top. Firstly, we are adding a lot of historical ships instead of generic “battleships”, “destroyers” and “submarines”. Together with new naval rules mentioned above, we felt this was important for more interesting and authentic naval experience. Secondly, we are trying to give smaller factions some more substance, so that they are better represented in the game. It does not mean that these factions will be able to fight the “big four” (Germany, USA, Great Britain and USSR) on equal terms, but we hope that they will become interesting enough to get their own content (scenarios and campaigns) as the series progresses. The classic PBEM++ multiplayer in Panzer Corps was very popular, and we will of course keep this option in the sequel. At the same time, some players felt that PBEM++ was not interactive enough and in fact “too old school”, compared to a “true” online multiplayer experience offered in many modern games. For these players we are adding a new Multiplayer mode which allows the players to be online at the same time, connect directly, and see each other’s moves in real time. Most importantly, PBEM++ and online modes are not separated. All games are still kept on the server, and you don’t need to commit to a single play mode when creating a new MP game. You can play a few turns of a game in online mode, then revert to PBEM++ for several more turns, then play online again etc. 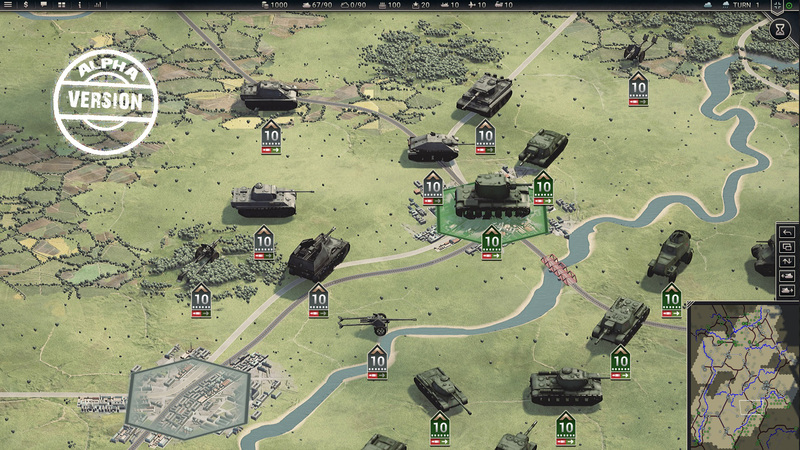 We hope that this new system will make multiplayer even more popular in Panzer Corps 2. Other changes in Multiplayer result directly from supporting up to 8 players on the same map. This gives us a lot of options to create competitive and cooperative games between several human and/or AI opponents. Also really glad that you're going to add historical ships. The game looks more and more promising! Dang, Rudankort, you've been busy! This sounds awesome. Really looking forward to some interesting naval combat. Any tidbits about air combat other than returning to airfields every turn? One question, will there be an option to add some sort of base to the units if the player wants that? What I mean, is in the screenie, it took me some time to spot the AT gun in the forest, so for us with less than stellar eyesight, I would love to be able to add say a red/white (or something) circular base under the units to make them easier to spot. It seems there won´t be a scenario editor? The reason why we aren't saying everything at once is that we want to save content for future dev diaries as well. Will there be a ranking mode for multiplayer? IMO the graphics looks great, I would like the environment a little darker. The units seem to float above the map. Are there any plans to let them impact the surface they are on? Well, I for one remember the complete ignorance of the community that has taken place over the last 18 months . All your posts seem to be complaining about various things. Why not try to see things from a developer's point of view or better yet, try to see the world in a more optimistic way? Life's not all about complaining. eventually ,with no response for the dev`s , it became a question of is the game still being developed ? Have they gone broke ? , what`s happening ? We don`t need pics , or inside info , but just a confirmation the game is still in progress . Well , You could hear the cricket`s but nothing from the dev`s . Well if there are Dev Diaries the game is still developed certainly. I like what I see so far. Will the files for equipment, awards etc. continue to be in text format (i.e. editable) as in PC1? Will there be a scenario editor? How about a campaign tree of some sort so we get an idea of campaign scale? All the above I find highly desirable! I should have the optimistic view of life that humanity is a good thing .